It's easy to see why Milk & Bone, the Montreal electro-pop duo, composed of Laurence Lafond-Beaulne and Camille Poliquin, is hitting a chord with audiences far outside their native Québec. Their breakout single "New York," a slow-burning tale of infidelity and heartbreak, has managed to catch the attention of the blogosphere at large, and for good reason; it's difficult not to be immediately enchanted by their soft harmonies mixed with subtle synths and drums. 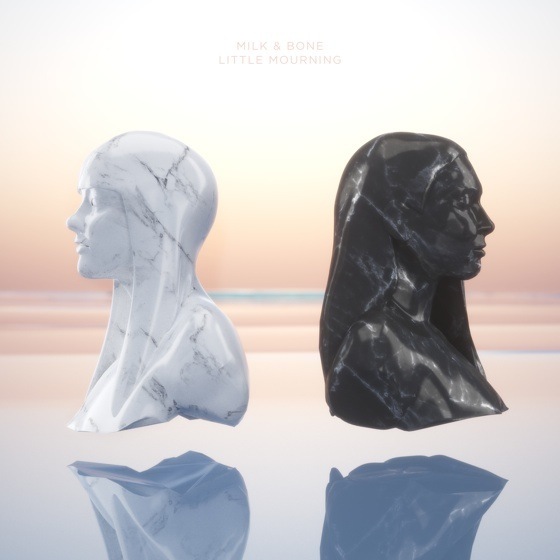 Milk & Bone's debut album, Little Mourning, capitalizes on this symbiotic relationship; it's a taut collection of tracks that constantly straddle acoustic simplicity — the beautiful piano-driven "X" — and the type of glittery electronica best exemplified by second single "Coconut Water." Both members are experienced musicians — Poliquin recently assisted Jason Bajada with his live show, while Lafond-Beaulne was busy touring with Les Soeurs Boulay — so it's easy to imagine Milk & Bone amassing more international acclaim than the acts they've supported thus far. Their debut album successfully strives for universality without pandering, as they've managed to cultivate a singular sound that happens to have mass appeal. "Tomodachi," featuring Toronto rapper Terrell Morris, makes a strong argument for more future hip-hop collaborations, as the combination works too well not to reproduce. Album closer "Watch" manages to encapsulate the entirety of the album's sound in one track, and effectively reiterates the strength of this debut release.